Summary : This is NOT an orange tea, so le'ts get that out of the way. Instead, it is as the name suggests...a Orange Passion Fruit. So, if you want a orange flavored tea, look elsewhere! That all said, this is an excellent passion fruit tea...with massive chunks of fruit. If you love passion fruit, then this tea is indeed for you! Review : When I order tea, I tend to go by the name of the tea. I generally am too lazy or in too big of a hurry to fully read the description...let alone to go out and do some research on the tea I'm thinking of buying. Instead, I just click "add to cart" and hope for the best. And this is how it happened that during my last order with the Dragonwater Tea Company (now out of business) that I ordered a sampler pack of their Orange Passion Fruit tea. I thought at the time that I was ordering a orange tea, you know, a tea meant to taste like an orange? The reason for that was because I saw orange in the title and said...this must be an orange tea. Additionally, I thought it must have been an orange tea because I was too lazy to investigate a new term, "Passion Fruit." I figured this was just a fancy label they put on the tea bag to sell more of it...not a entirely different fruit altogether! For this reason, I got a very big suprise when I opened up the tea bag and was greeted by not a orange aroma but something entirely new. I realized either I got a tea totally unexpected or that this was an orange tea that was going to taste awful. Once I got over the shock of the unexpected aroma of this tea, I was surprised at how big the "leaves", if you want to call it that, were. 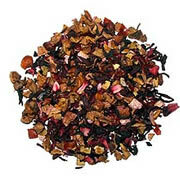 You see, this is a "whole fruit tea," which means that the tea is basically various dried up fruit all mixed together. I knew this was a whole fruit tea when I ordered it...still...the large size of the pieces here through me off for a bit. Although in this case it was a good surprise...far as I'm concerned, the bigger the pieces the better. Anyways, I went to brew this tea and waited the 5 minutes and got a REAL big surprise. First, instead of a "orange colored tea," what I got insteasd was one of the most beautiful teas I've run across yet...a beautiful, somewhat light pink color. A pink tea! So cool. Due to this beautiful color, by all means, when you make it yourself make it in a clear cup! There is something about this pink color that just says, wow! And lastly, there was the taste. As this was my first ever passion fruit tasting experience, I had zero idea what to expect. And what I got I liked. Maybe not my favorite tea, but this is by all means a tea I could drink quite frequently. The taste is surprisingly light, not overwhelmingly powerful and has a very unique flavor. Definitely not your typical "whole fruit tea," which often can prove to be almost "too strong." Recommendation : Yes. Remember, this is NOT an orange tea. This is a orange passion fruit tea. So, if you are seeking an orange flavored tea, you will not find it here. Instead, you'll get the light and rather sweet taste of passion fruit in this beautifully colored tea. Brewing Instructions : Use one teaspoon of tea leaves. Pour 1 cup (5.5 ounces, but 6 works quite nicely) boiling water over the leaves. Let the tea brew for 3-5 minutes.